delivery | Oh Happy Dae! 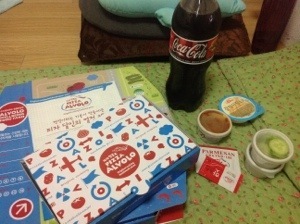 If there’s one great thing about Korea it’s gotta be the food delivery options. There are oh so many to choose from. Chinese? No problem. Fried chicken? Easy peasy! McDonalds? Heck yes. Now I haven’t done much with delivery on my own because I don’t have a lot of confidence using Korean over the phone. I usually just do take-out. But then I was clued in on a site called Yogiyo. I believe it’s a play of the phrase 여기요, although they spell it 요기요. In restaurants if you want to get the server’s attention then you say “yeogiyo!” (Excuse me/over here). Anyway Yogiyo is great because it’s all online. You do need to be able to read some Korean, but I’d say it’s fairly easy to understand. You choose your city and district/neighborhood and it’ll find restaurants in your area that’ll deliver. I’d say the difficult part is knowing the name of the dish you want in Korean, but if you’re just getting chicken or pizza than no big deal. The nice thing is you don’t need to sign up for it either. You just put in your address and phone number, and *yay! * food!. 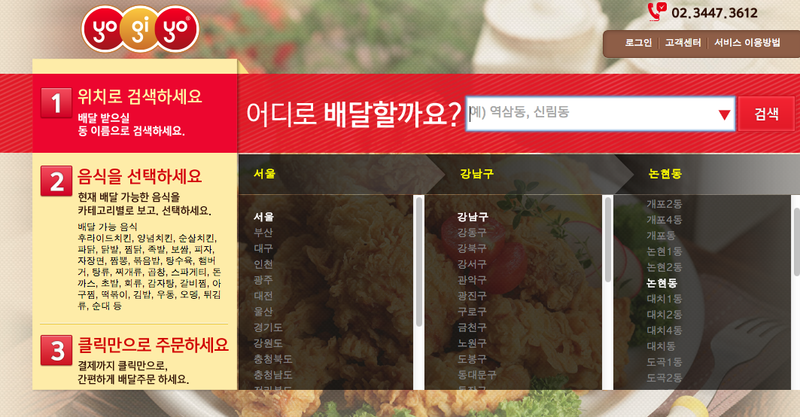 Last Friday I ordered pizza from Pizza Alvolo (피자알볼로), which I actually hadn’t heard of till then. I got this in about 40 minutes and it cost me 24,000 won. Unfortunately pizza is pretty pricey in Korea. Some places are cheaper than this, but this was my option later at night. I got the bacon cheddar large pizza with breadsticks. 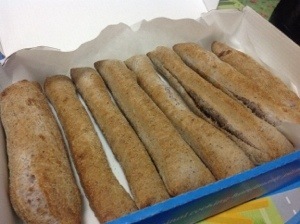 The breadsticks were hot and crispy plus they came with marinara sauce. I don’t see them too often so I rather enjoyed it although they we’re fairly plain. The pizza was good too. I didn’t like the onion on it, but it wasn’t that bad. I thought the crust was whole wheat, but it was actually a kind of purplish color so I’m not sure. Still, when it’s after 10 PM and you don’t have anything to cook then I’d say this was a decent meal. For Yogiyo you can pay cash or by card. Also, unlike in the U.S., you don’t have to tip the delivery guy. Not so great for him, but nice for us. I really recommend using this site if you’re phone-shy like me. It takes the hassle out of things and you end up with yummy food. Win-win! There’s plenty of good food to be had in Korea. While I don’t eat Korean food all the time, save for at work, I do enjoy it. But sometimes you get cravings for the food you like back home. “Ah, I could really go for some Mexican food about now,” you think one day. If you’re lucky enough to live in a big city you may find a restaurant that sells such food. The thing is they tend to be a bit pricey. While in the U.S. a burrito might set you back around $6 at Chipotle or Qdoba, here they may run between $12-18 (and they’re smaller too). But fear not, friends! Gringos Korea has got you covered. I learned about them by word-of-mouth. Two guys, Mike and Mark, working out of Ilsan having been cooking up food for fellow expats for a couple years (at least as long as I’ve been here). Everything is made for scratch and delicious. They have 6 kinds of burritos – chicken, ancho carnitas (pulled pork), carne asada (steak), tofu, bacon breakfast burrito, and chorizo breakfast burrito. They all range between 5,500 – 7,000 won. They are all, also, quite yummy. I’m a fan of the pork and breakfast burritos. 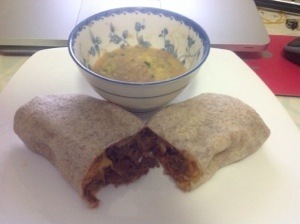 They also have bean n’ cheese dip, salsa, and chili which go for 5,500 won each. I honestly recommend everything especially the chili. Nothing like a cup of chili when it’s chilly out. You might be thinking, “Mail order burritos? Whaaaaat?”. I too was somewhat confused, but it’s pretty nifty. They send all orders out Monday and guarantee next-day delivery. 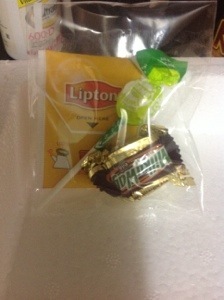 Your delectable package will arrive in a styrofoam container like mine below. 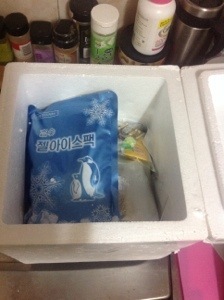 You can freeze your order right away or throw it in the fridge. I personally put it in the fridge because a) they re-heat better and b) they only last a couple days in my house. I can’t resist gobbling them up ASAP. Take a gander at the carnitas burrito and bean dip I had today. Very satisfying! Ordering is simple. You can email them at gringosburritos@gmail.com or hit them up via message on Facebook – ‘Gringosburritos’. Final order day for the week is every Thursday, so try to get them in early. You pay via bank transfer, and them give them your mailing address and phone number. Then all you have to do it wait. That is probably the hardest part. It’s well worth it though. You also have to order a minimum of 6 items, but that’s pretty easy to do too. If it seems a bit much for you I recommend ordering items and having a dinner party with friends. I did that before and you will definitely have some grateful amigos if you feed them this yummy food. Check them out at Gringos Korea.